This character can be found in Central Yharnam, behind a window. reached by going around the sewers and climbing back up a ladder past a Troll, she is next to a gate that returns you to the first Brick Troll you met. She asks that you find her mother, Viola, who has gone to look for Father Gascoigne. 1. Return to her after defeating Father Gascoigne and picking up the Red Jeweled Brooch. It can be seen on the rooftop. Just go up the stairs and drop on the roof. 2. Choose whether to give her the Brooch or withhold it (withholding means use it for yourself, don't pick it up, or store it in the Hunter's Dream). 2a. If you give the Brooch to her she will no longer talk to you. Eventually she will leave her home. Defeating the pig in the sewers will yield a Red Messenger Ribbon. 2b. If you don't give her the Brooch, and have visited the Oedon Chapel about it being a safe haven, you can tell her to go there for safety. If you choose the Chapel the blood soaked ribbon will still appear on the pig. 3. Her Older Sister will appear in the window after you either gave the Brooch or told her about the Chapel, and have killed Rom the Vacuous Spider. She will ask you to find her younger sister who has a White Ribbon. Turn in the Red Messenger Ribbon. 3a. Standing outside of her window for a while will trigger a dialog of the sister talking to herself. 4. Reload the area and go down the ladder from the window to find the White Messenger Ribbon. 1a. If you have visited Iosefka after defeating Father Gascoigne and been told about it being a Safe Haven you can direct her to Iosefka's Clinic. The next time you visit the clinic you will receive a Lead Elixir, but the red ribbon will not appear on the pig in the sewers, which also prevents you from getting the white ribbon. But if you now enter the clinic's back door, from the Forbidden Woods, the young girl can be found inside, transformed into a celestial being. 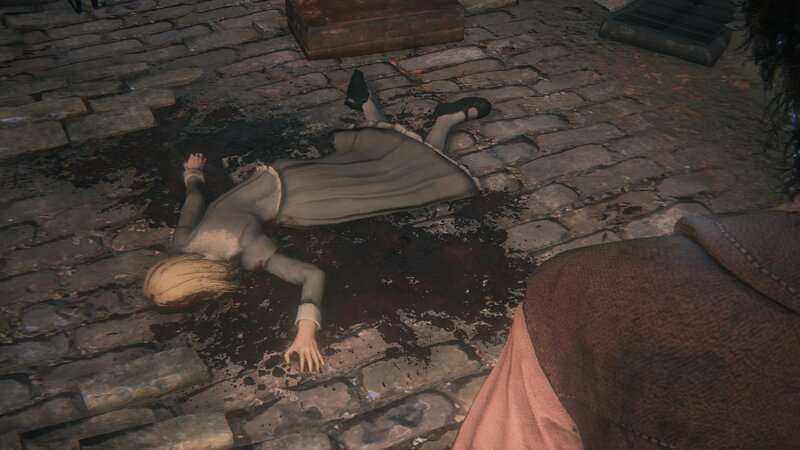 She's the one walking back and forth in the main hallway, near the room with the Cainhurst Summons. If you kill her she will drop the Formless Oedon rune. 1b. You may also opt to never interact with her again any time after receiving the music box (or just never talking to her at all) and she will eventually disappear from the window on her own, causing a similar premature end as sending her to the clinic, but with no rewards. "Who... are you? I don't know your voice, but I know that smell... Are you a hunter? Then, please, will you look for my mum? Daddy never came back from the hunt, and she went to find him, but now she's gone, too... I'm all alone... and scared..."
Find Girl's Mother: "Really? Oh, thank you! My m-mum wears a red jeweled brooch. It's so big and... and beautiful. You won't miss it. Oh, I mustn't forget. If you find my mum, give her this music box. [Receive Tiny Music Box] ... It plays one of daddy's favorite songs. And when daddy forgets us we play it for him so he remembers. Mum's so silly, running off without it!" "My mum wears a red jeweled brooch. It's so big and beautiful. You won't miss it. Oh, and if you find her, give her this music box. Please, I know you can do it." Refuse: "Oh, alright... Well th-thanks mister hunter, for talking, at least. Take care, on your hunt." "Thanks for chatting. Please be careful out there!" After reloading: "Are you that hunter? Can you look for my mum?" If you refuse to help and talk to her after beating Vicar Amelia and triggering nightfall, she cries: "Mum, come home... I'm alone... I'm scared... It's not fair... "
"Hello mister(miss) hunter. Still cant find my mum?" Give: "Miss Hunter... was it really her?...Mummy...mummy... Don't leave me alone..."
"Yes, okay. I can wait. Mum knows I'm very brave, and you're very kind. I'll be a good girl. I promise"
"Oh, okay. But isn't there something I can do? Maybe mum and dad are stuck out there, waiting for me to come to them. What do you think, mister(miss) hunter?" Tell of Oedon Chapel: "Yes okay, thank you very much mister hunter! I love you almost as much as mum and dad, and grandad!" Withhold Information: "Yes, i see... I can wait, I won't be afraid. I know, I do. The morning always comes." After turning in the Brooch, idling outside the window for several moments will elicit the whispers of a man, saying "So, call out to your sister...". "Oh, you haven't by chance... seen my little sister, have you? I told her to look after the house, but she's run off somewhere. She's still quite small, and wears a big white ribbon. Have you seen her out there anywhere?" Give Red Messenger Ribbon: "Oh, how did this happen... Why would she ever go outside? At least... I'll have something to remember her by. Do Not Give: "Oh, okay then. But if you do see her, would you give me word? She's a small girl, with a big white ribbon. My dear little sister..."
After not giving Ribbon and talking again: "Oh, back again? Any news of my sister?" "What a perfect ribbon, and now it's mine. I can't wait to try it on." Young Yharnam Girls are Gascoigne's daughters and, very likely, Henryk's granddaughters. If you progress too far in the story before completing the quest, it becomes impossible to complete as checking the window will yield "[No Response]" like many other windows and door around Central Yharnam. 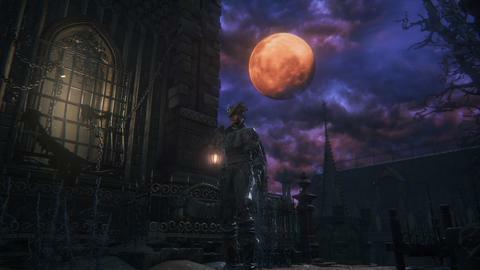 A rumor states that the Yharnam Girl can reach the Cathedral Ward if the player avoids picking up her mother's brooch. This has been tested proven false. To initiate this quest, seems like she must be talked to before advancing the night (Killing Vicar Amelia), else she'll say a generic line of where her mother is, followed by "No Response" if you go away and come back. If she hasn't give you the Tiny Music Box yet, you can hear it playing when you are in the area nearby her window. The White Messenger Ribbon is actually the very same ribbon as the Red Messenger Ribbon, the older sister only washed off the blood, which is why you can't hold both ribbons at the same time. For Cannon users, it is highly recommended to send the little girl to Iosefka's Clinic due to the Formless Oedon rune, by stacking all three runes, one can fire the Cannon for up to 4 times. Even if you withhold information from the little girl she (presumably) still dies. If you kill the boar in the sewage tunnel after reloading the game you will find the Red Messenger Ribbon. So it is speculated that she tried to run away from home after hearing her parents were both dead from you. i just notice little girl after killing vicar amelia..i cant trigger side quest dialogue....how should i do? Wow, this quest is just horrific, so the options are; 1) get her killed for nothing. 2)get her killed for a hairband and conspire with some freak... 3) kill her yourself, after you cause her to transform into some celestial being. 4) leave her alone and let the freak kill her for the hairband. This is one moral dilemma, personally, it&apos;s got to be 3 really, the other options are cowardly, that must be some game changing ribbon. I don&apos;t even get the option to give her the brooch she just continues to say the same thing. I really wanna do this side quest. Does killing Vicar Amelia cancel this because Rom is the next boss? I&apos;ve just been to Oedon Chapel. Even sent the old lady there as a confirm that the chapel is a safety location. However, the when arriving at the Little girl&apos;s window, my only options was to give or not to give the brootch. What happens if you dont give the brooch and you withhold the information? Her sister comes back and stay with her? The title of this page being Viola makes it sound like the girl&apos;s name is Viola when that&apos;s her mother&apos;s name. So i killed gascoigne before going to her, now she just asks for her mother, what should I do? kept the broach and killed rom, the sister never showed up. Interacting with the window it just says there is no response. Anyone come back to the window later on in the game and its broken open and she&apos;s gone? If you tell her of the clinic an then immediately go an kill Iosefka, can she be saved? HOW MANY THINGS HAVE BEEN TESTED!?! Q-Q Why must we try so hard to save one little girl we know not the name of? wish I could save this girl. would even buy a dlc just for this... so sad..